The following diagram shows an example PTZ camera system installation using the CK-983321 PTZ Camera Controller, the iDVR-PRO CCTV Camera DVR, and 3 Pan Tilt Zoom cameras. This 18/2 power cable can be used to for the RS-485 communication between the joystick and cameras. Learn more about the PTZ cameras here and view a demo video of a PTZ camera here. Learn more about the above controller here: PTZ camera keyboard controller. 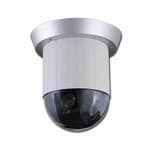 iDVR-PRO surveillance DVRs are compatible with RS-485 controlled PTZ cameras as well as UTC (up the coax) type PTZ camera.